iTweetreply is an app with a pretty straightforward mission; provide push notification of Replies, DMs to the iPhone, iPod touch and iPad. It has recently been upgraded to Version 2.0. But as I quickly found out, this is not a case of ‘new and improved ‘. Till now I was using version 1.2.2, which did its job quite nicely, as I reported back in August 2009. When a notification appeared a swish would open the app where you could view it and reply or DM in-app. 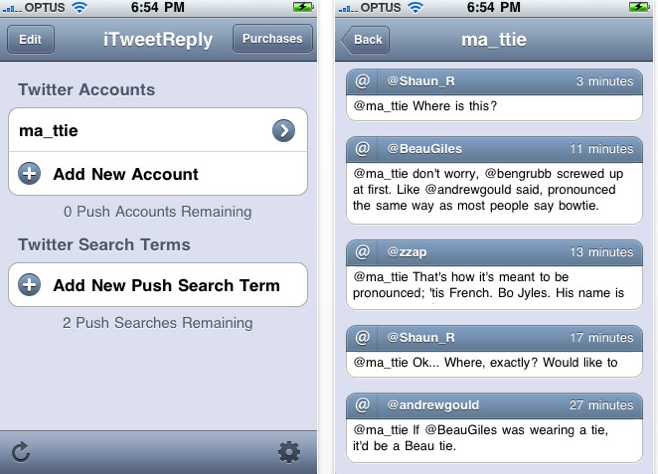 Indeed, it was a fully functional twitter app as well, showing a twitter timeline in addition to replies and DMs. I had noted at the time one drawback, that it could handle only one account. Now its developers Syncode have launched iTweetreply version 2.0 which ‘now focuses on push notifications, offering multiple account support, the ability to push Twitter search terms, unified push history, opening a notification in a Twitter client, advanced Tweetie 2 opening, iPad support and more ‘, as quoted from the developer blog. The problem is, the app has not progressed but regressed for me and my needs. iTweetreply 2 no longer lets me retweet or reply in-app but gives you a choice between several twitter apps. Why? And why isn ‘t Tweetdeck for iPhone on the list? I also promptly tried out the search terms but gave up as I was getting constant notifications. Of course this varies according to the search term used but I ‘m thinking I ‘d be using this very rarely as it is quite roundabout. Imagine the search term ‘lady gaga ‘ “ you ‘d be constantly bombarded and directed to your twitter app to check out details. Do many people want this? Multiple accounts are of course a good idea but the developers want you to pay US$ .99 for additional accounts. Really? After I ‘ve paid for the base app I should pay more just for additional accounts? To be fair, I tried to purchase an account. Which did not work. My iTweetreply (bought on the Austrian store) showed the price in US dollars and even when I pressed the button to order “ nothing happened. When asked about this the developers say that they are aware of the issue “ which did not turn up during testing and is dependent on Apple’s in-app purchase system. They are working to fix it. But I think the biggest issue at the moment for me is that the app is buggy. I ‘m sorry to report that the app crashes, lags and is unresponsive in general. All in all I am not impressed at this at all. I ‘m a pretty loyal person, when I find something I like, I keep it and I ‘m really loyal. But my tolerance only goes so far. Here ‘s to hoping that the makers of iTweetreply rethink this app otherwise I and other users will look for other solutions. 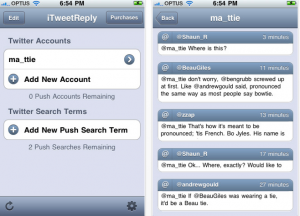 You can buy iTweetreply on the App store for US$ 1.99. I agree. It's a shame seeing iTweetReply goes retarded. The app crashes 80% of the time now. Push for search terms is not reliable at all and that the only thing that keeps me using an app from Syncode. I have to delete my account and add to get Push work again and again too. Any other apps out there can Push a search term I will be happy to switch to? I think the developers are enjoying too much of the Aussie outback then.